Why would I want to take MAXIMUM MILK THISTLE®? Because it provides the greatest support for your liver at the best price. No other milk thistle product can compare. Anyone who has a need or desire for maximum liver cell protection and wants to get the most for their investment can benefit from taking MAXIMUM MILK THISTLE®. This includes people who live or work in a toxic environment, persons who are taking recreational or pharmaceutical drugs on a regular basis, those who are moderate to heavy drinkers of alcohol, and anyone with a liver condition that may threaten the integrity of liver cells. All of these situations can put stress on the liver and would call for greater support and protection of this very important organ. I can get regular standardized milk thistle extract for much less money elsewhere, so why should I choose MAXIMUM MILK THISTLE® instead? According to clinical studies, MAXIMUM MILK THISTLE® is absorbed eight to ten times more effectively than regular standardized milk thistle extract. If you choose to use a standardized extract, you may be paying less for the bottle, but you are paying much more for what actually reaches your liver. Look at it this way; if you get 100 capsules of standardized milk thistle for $12 and each capsule contains 175mg, you would need at least eight bottles of that product to have the same amount of protective substance reach your liver. That would cost you $96 (instead of $34.95 for MAXIMUM MILK THISTLE®). So, while it looks like you are paying less for regular standardized milk thistle extract (and you are per bottle) you are actually paying much more if you measure based on effectiveness. This is a clear case of "you get what you pay for". How much more absorbable is MAXIMUM MILK THISTLE® compared to milk thistle extract standardized to 80% silymarin? Clinical studies have shown the Phytosome® form used in MAXIMUM MILK THISTLE® to be eight to ten times more absorbable. This means you would need that much more of the other to achieve the same level of protection in your liver. Is MAXIMUM MILK THISTLE® available in health food stores? MAXIMUM MILK THISTLE® is currently available only through LiverSupport.com. That helps us to keep costs down to make the product more affordable for you. You are essentially paying the wholesale price store owners would pay if this were offered for sale through health food stores. You can currenly get products in health food stores that contain the same patented raw material, but they are much more expensive. 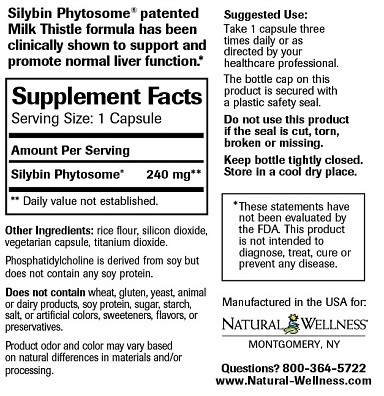 Who manufactures Siliphos®, the active ingredient in MAXIMUM MILK THISTLE®? An internationally respected European medicinal/botanical research company is the developer, patent holder and manufacturer. They have been on the forefront of herbal medicinals since 1921. Each year, they sell more than 2,000 pounds of Siliphos®, the world's most highly effective natural liver protector. We purchase the raw material directly from the manufacturer and encapsulate and bottle MAXIMUM MILK THISTLE® in state-of-the-art facilities in the United States. How much is recommended to take per day? Three capsules per day is the recommended dosage. With 90 capsules per bottle each bottle is essentially a one month supply. How was the recommended dosage determined? The recommended dosage was determined by reviewing the clinical studies and choosing the median dosage that was shown to have a beneficial effect under physically adverse conditions. The same studies indicated that a higher dosage could have a greater beneficial effect but we wanted to keep the product both effective and affordable. For those who can afford it (and feel they prefer it), higher dosages are considered just as safe. The highest dosage tested was 360 mg (as silybin) daily, which would equal four to five capsules of MAXIMUM MILK THISTLE® per day. No. Milk thistle has no anti-viral effects. It has been scientifically shown to protect liver cells from damage and help to regenerate liver cells. For tens of thousands of people worldwide with liver concerns this is reason enough to take milk thistle products on a daily basis. Can MAXIMUM MILK THISTLE® reverse cirrhosis of the liver? Milk thistle is not intended to treat any condition or disease. It has been shown in clinical studies to protect liver cells from damage and help regenerate liver cells. Cirrhosis is generally considered an irreversible condition that can sometimes be slowed or halted depending upon the severity and cause. For example, cirrhosis caused by alcohol consumption can sometimes be stopped in its tracks by the complete removal of alcohol from the diet. This you need to discuss with your primary healthcare provider. Is MAXIMUM MILK THISTLE® safe? Clinical studies have shown it to be so non-toxic that it can even be used by pregnant or nursing women with no harmful effects. Although rare, one study noted that an ingredient in milk thistle may inhibit the bacterial enzyme, beta-glucuronidase, which helps oral contraceptives work. Therefore, milk thistle could potentially reduce the effectiveness of oral contraceptives. Consult your medical professional prior to use if you have, or suspect you have, any medical condition, are currently taking prescription drugs, or are pregnant or lactating. Be sure your doctor or pharmacist is aware of all the prescription and non-prescription medication you take before you begin to use any herbal supplement. How long can I safely take MAXIMUM MILK THISTLE®? The clinical studies showed no detrimental effect from longterm usage. In fact, they indicated a sustained beneficial effect with longterm usage. So, for as long as you want to provide protection to your liver, you can take MAXIMUM MILK THISTLE®. Could you provide your Supplement Facts? Should I take MAXIMUM MILK THISTLE® with meals or between meals? Other milk thistle products recommend you take them with meals because they hope it will increase absorption. Because MAXIMUM MILK THISTLE® is created through the Phytosome® process (where one molecule of silybin is bound to two molecules of phosphatidylcholine) the body recognizes it as a food and easily assimilates it (takes it in) on its own. We, therefore, recommend it be taken between meals so it can be digested and absorbed on its own for maximum delivery to the liver. However, it is not a problem to take it with meals if that is easier or more convenient for you. Can I take MAXIMUM MILK THISTLE® if I am on Interferon® or Rebetron® therapy? There are no known interactions with milk thistle and other drugs or herbs. You may want to educate your primary healthcare provider and alert them to the fact that milk thistle has been shown to lower elevated enzyme levels by protecting liver cells. This way they can be aware that MAXIMUM MILK THISTLE® could very well contribute to lower enzyme levels. They may want to take that into account while evaluating clinical progress. Are there any contraindications to using MAXIMUM MILK THISTLE®? According to the clinical data, there is no medical reason not to take milk thistle extract of any kind. (See the answer to the first question dealing with safety, especially the information on the German Commission E Monographs). Should I tell my doctor I am taking MAXIMUM MILK THISTLE®? Yes, by all means, and refer your doctor to the clinical studies and the other relevant information included on this website if he/she is unfamiliar with milk thistle and its uses and benefits. If your doctor is closed-minded about herbal or other natural approaches, perhaps you should get a second opinion from a physician who takes a more integrative approach to healthcare. Our money-back guarantee is threefold. First, we guarantee there is no better natural liver protector than milk thistle extract. Second, we guarantee you cannot find a more powerful and effective milk thistle product than MAXIMUM MILK THISTLE® anywhere, at any price. Third, we guarantee you cannot find a milk thistle product even nearly as effective as MAXIMUM MILK THISTLE® for less money. If you are unsatisfied for any reason simply return the unused portion within 30 days from the date of purchase and you will receive a full refund on the product purchase price. Please include a copy of your invoice with any returns and send the package to the address on the invoice. We value your feedback. Please let us know how we can serve you better.